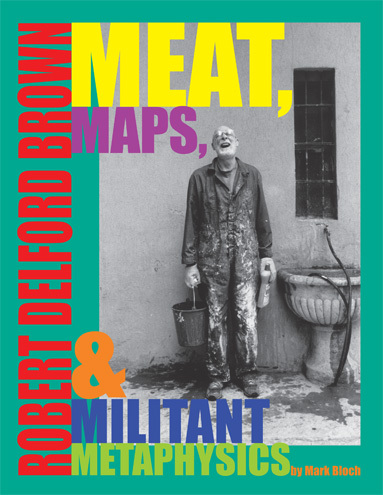 Attention art, comedy and religion enthusiasts, the catalog for the Robert Delford Brown show, published by the Cameron Museum of Art is now available here via a secure direct connection to PayPal where you can use your credit card, bank or PayPal account to purchase the book. It will be sent to you within 10 days. The price is $49.95 including postage so ORDER NOW BY CLICKING the BUY NOW BUTTON to the right, under the picture of the book. Once you click BUY NOW you will be connected directly to PayPal and your information will be completely safe and secure, unseen by anyone except yourself and PayPal. Satisfaction completely guaranteed! If you have any questions, please write to me at panman <a> panmodern.com -- and change the "at" sign in your email. Or if you'd rather do it the old-fashioned way, just snail mail me at PO Box 1500 NY NY 10009 and send a CHECK OR MONEY ORDER for $45 for every book you want and I will get your book order to you personally. I designed and edited it and did quite a bit of writing on the fascinating world of R.D. Brown who did his first Happening in 1964 and has been making art ever since. The book is jam packed full of interesting documents and historic never-before-seen vintage black and white and color photographs--the catalog is 156 pages, printed in full color with essays and contributions from the likes of Walter Hopps, Emmett Williams, Allan Kaprow, Hermann Nitsch, V. Vale of RE/Search publications, Peter Frank, A.D. Coleman, Richard Kostelanetz and others. I also have been doing a lot of writing about Robert Delford Brown for many years-- including this article in White Hot Magazine-- an interview with Robert Delford Brown about the New York art scene in the 1950s. Order your copy of this historic limited editon document Meat Maps and Miltant Metaphyics today.